The Commercial Hotel is a family run hotel located on the High Street and is very central to the main shopping area. The Hotel has 10 newly decorated (2008) en-suite bedrooms, a lounge bar, public bar with Sky Sports and car parking. 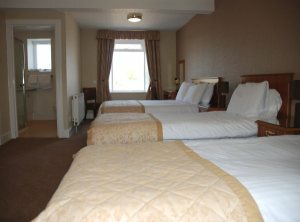 All rooms are en-suite with tea and coffee making facilities, trouser press, hairdryer, colour TV and radio alarms. The 3 G's lounge bar is modern and comfortable, serving bar meals daily. The Station Hotel was built in 1903 and is distinctive by its elegant corner tower overseeing the High Street. The Station Hotel is located on Alness High Street and very central to the main shopping area. There are 7 bedrooms, a lounge bar, public bar and car parking. A range of well prepared meals and afternoon teas are available everyday of the week throughout the year.